Peel apart kitchen paddle is an eco-friendly, unique and useful tool made with bamboo. Unlike other pizza peels this one comes in 2 parts, each part measures 6" x 20". The working part of the paddle measures 12" x 12". We can use one or both of it depending on the size of the pizza or bread. This paddle is handy and can be used for serving cheese, making bread, flatbreads and for other baking needs. This peel apart kitchen paddle is very smooth and easy on the hand because it is not heavy. When not in use we can easily store in the cupboard or conveniently hang the paddles as it has holes on the holding portion of the paddle. The paddle cleans easily by hand without a hassle. I like the innovative design and the earthy colour of the bamboo wooden board. To use this paddle for pizza, first prepare the pizza on it, lift the right paddle slightly before peeling apart and then rotate the pizza in place by moving the paddle back and forth to place it in the oven or baking sheet/stone. To pick up the finished pizza use the tapered sides of the paddle and simply lift. I am happy that I don't have to worry about the pizza breaking apart and toppings falling off when I pick it up from the oven and grill. 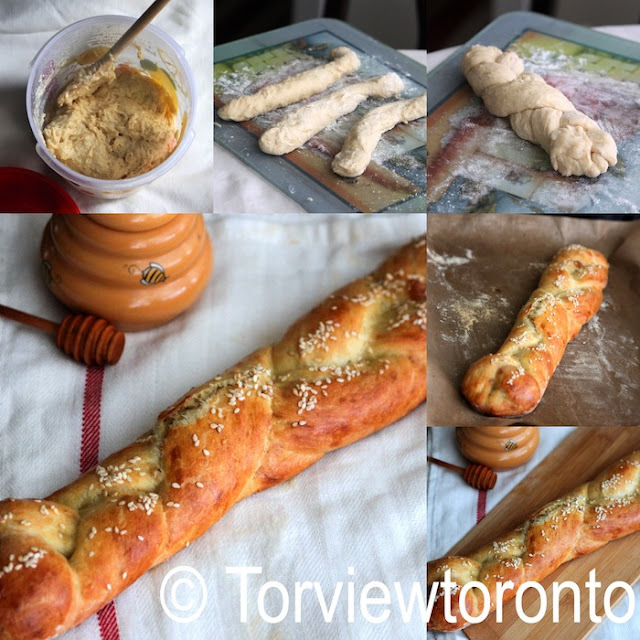 Here is recipe for challah bread adapted from Artisan bread in five minutes a day. Mix yeast, salt, eggs, honey, melted butter and water in a container with a lid. Mix the flour with wooden spoon don't knead. Cover and rest at room temperature until the dough rises and collapses about 2 hours, don't cover the container airtight. The dough can be used after the initial rise. It is easy to work with if the dough is chilled a little in the fridge, so keep it in the fridge with the lid on. Prepare a cookie sheet or line a baking sheet with butter. Dust flour on the surface of the rested dough, and cut 1 pound grapefruit size piece. Dust flour on the working board and quickly shape dough into a ball tucking the dough in the bottom. Divide the ball into 3 parts and make thin long ropes. Braid the ropes starting in the center and working to the end. Turn the loaf over, rotate it and braid from the center out to the other end, this will help make a uniform thick bread. Allow the fresh braided dough to rest for about 40 minutes. If it is refrigerated dough, let it rest for 1 hour and 20 minutes. Brush the loaf with egg wash and sprinkle seeds. Bake at 350F in the center of a preheated oven for 25 minutes, the time depends on the size of the loaf. If it is golden brown and the center of the loaf is resistance to pressure it is ready. Cool and slice to eat. This dough can be kept of 5 days in the fridge, if more than 5 days leave it in the freezer in an airtight container for up to 4 weeks. Defrost frozen dough overnight in the fridge before using. Then allow it to rest and rise again. Love the challah bread.. Perfectly baked.. I"ve never used a pizza paddle. I always worry that the pizza won't slide off...this paddle looks easy to use. Love the challah bread...it's one of my favorites! It is a useul thing for the kitchen. lovely review of kitchen paddle,Akheela..n the bread looks soft too.. 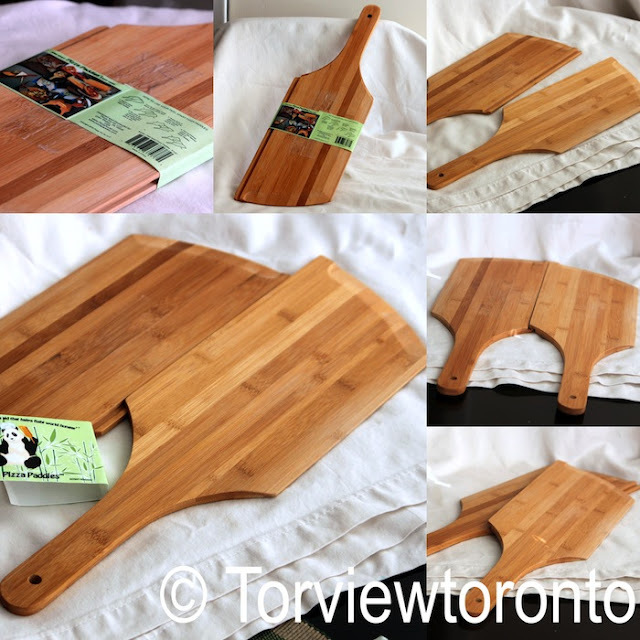 Attractive and Divine kitchen paddles !! And the bread looks so rightly done !! perfect one !! delicious dear..rush your entries to ongoing event ; fruit of the month-grapes in my blog. Gorgeous and useful paddle. I love those kinds of things. Your challah looks fab. I've not tried making it myself. Have always wanted to though. Lovely Challah :-). I made Artisan in 5 low fat Brioche last week, it also turned out great. Isn't it an amazing book ! The challah bread looks delicious, I can imagine the wonderful aroma fresh from the oven! Cool paddle too. Wow u have so many varieties if paddles.. Great.... N challah came out too good..
Looks too good !! Bread is perfectly done !! lovely bread...look at those huge air gaps. perfect for bruschetta. lovely bread and its perfectly baked, nice review of the kitchen paddle..!! Great to have that paddle in the kitchen! Beautiful bread! Hi Akheela, your challah bread look good, very fluffy. I love the kitchen paddle, very interesting and my first time seeing this paddle. Very great product sharing you have done and the bread looks so tempting to me. i've always wanted to make challah but thought it's too difficult to plait, yours look stunning. Great looking challah bread, i dont mind having a slice rite now. I love this kitchen paddle! Your challa bread looks so rustic and amazing Akheela! Love homeamde bread! Your challah looks perfect. Your challah looks awesome...I still yet have to try to bake challah. Lovely challah and great paddle! YOur challah is absolutely stunning! I've never gotten mine to look that good. A perfectly baked challah bread. Wish I have that paddle! And your bread looks fantastic! Will be nice to own the paddle, bread looks awesome..
Challah bread looks super delicious! Gorgeous bread, sounds delicious! Fantastic! I love challah braid and can't wait to try making this!